April is Earth Day Month. While Earth Day is officially Monday, April 22nd, we're celebrating – and drawing attention to the need to REUSE – all month long. It's a great opportunity to reflect on how we can reduce our impact on this beautiful planet of ours. For example, if we reduce our consumption of plastic shopping bags and take reusables instead, we help reduce plastic waste going into the landfill and ultimately, our oceans. To this end, we're offering you a FREE gift during Earth Month – a reusable Envirosax designer shopping bag with any purchase of $30 or more. 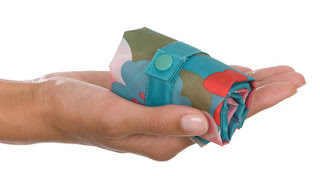 * It's a gift for you and ultimately the planet too, valued at $9.95 – to help you reduce and reuse, in style. Use code REUSE through April 30 to receive your free gift. Envirosax bags not only look great, but they fold down to the size of a piece of sushi for compact storage plus they’re waterproof, washable and can carry up to 44 lbs! The inks and dyes used in the printing of the bag are eco-friendly and no carcinogenic amides are used. 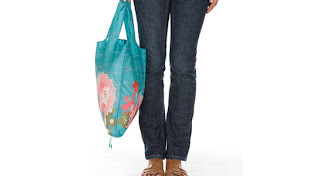 The printing process used ensures the bags will not fade when washed. Design may vary from that shown. Plastic does not decompose. Over the years (and years) it just breaks down into smaller and smaller bits of plastic that end up floating in our oceans (The Pacific Garbage Patch) and are eaten by fish that we, in turn, eat. Every piece of plastic you and everyone you know has ever used is still out there. 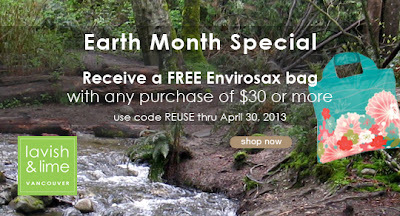 Our Earth Month Special applies to any purchase of $30 or more before taxes and shipping. This offer cannot be combined with any other promotional offer. Offer is valid through April 30, 2013. Bag received will be randomly chosen and design may vary from that shown.